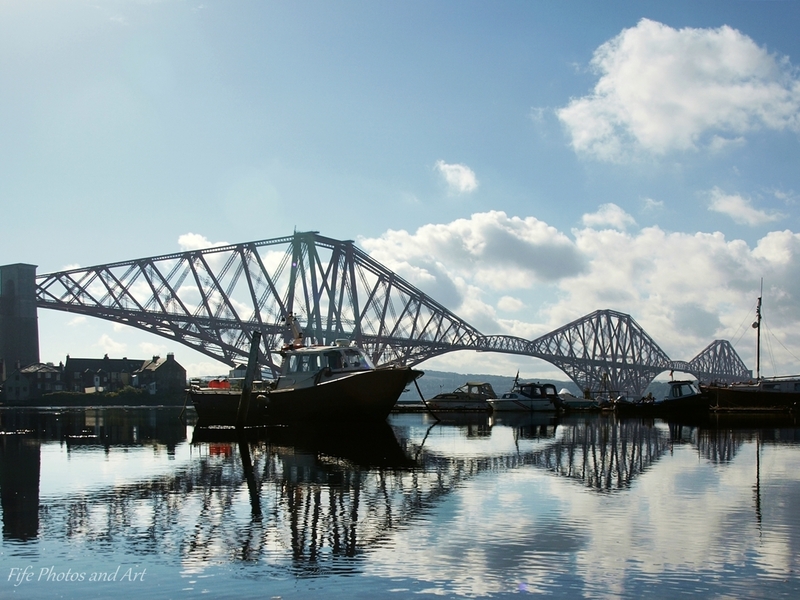 The next three are of differing views of the three cantilevers that make up the Forth rail Bridge. 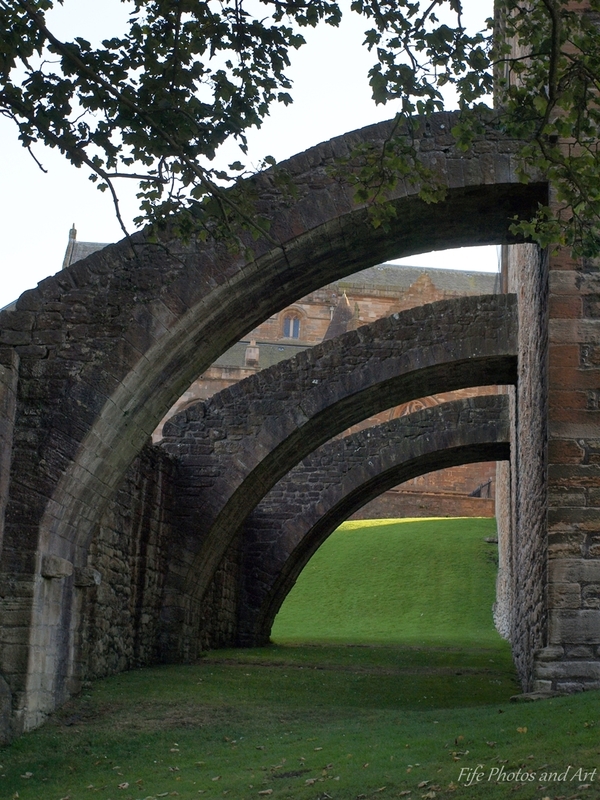 The fifth image is of the three flying buttresses that are supporting the East wall of Linlithgow Palace in West Lothian (this section was built in 1430, by James I of Scotland). 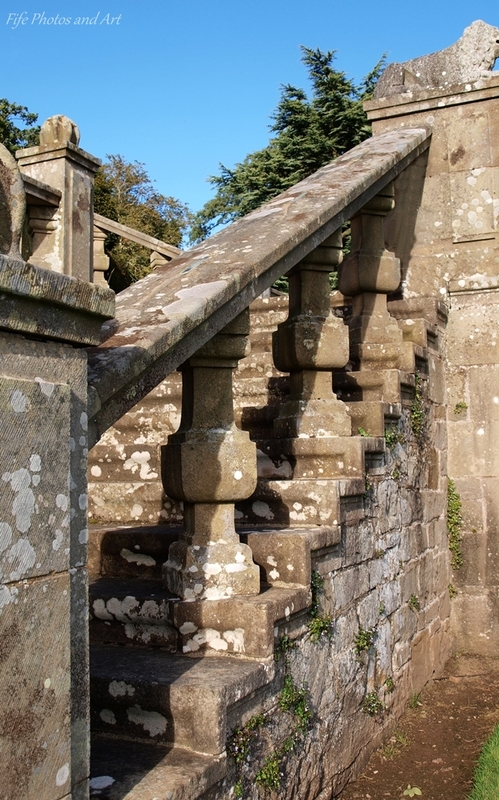 The sixth photo is of part of the steps leading from Hill of Tarvit House upper terraced garden to the lower lawn. It shows three of the sculptured supports for the stone railing. 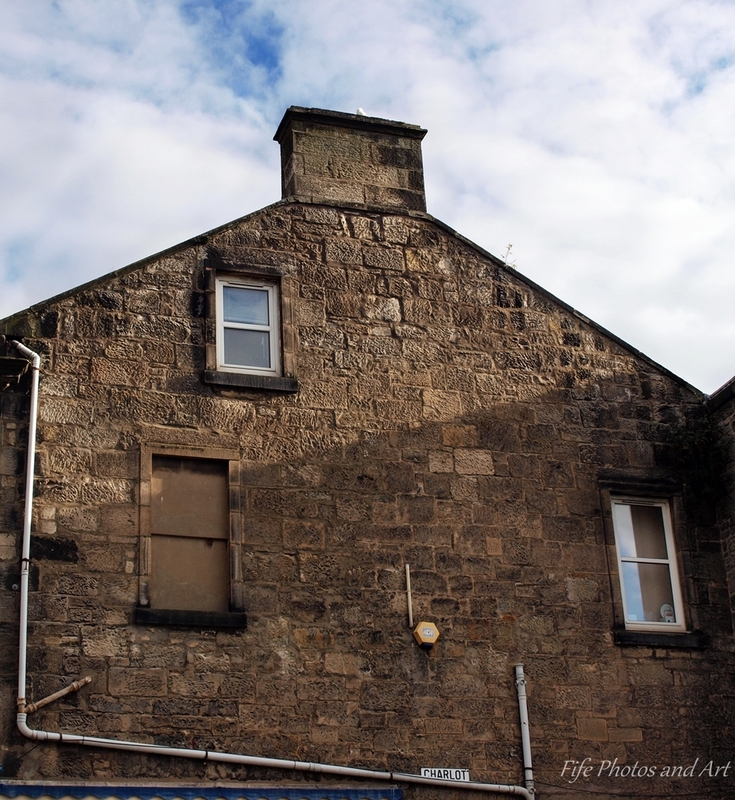 The seventh photo shows three windows on the side of a large house, in Kirkcaldy High Street. It is interesting, because one of the windows has been blocked in. This was due to the introduction of the ‘window tax’ in Scotland in 1798, which wasn’t repealed until 1926. An owner of a house was taxed for every window in his/her house, but if the window was bricked up, you didn’t pay tax on that window. Throughout the UK there are many thousands of windows of houses that were built in Georgian/Victorian/Edwardian times, which have been blocked up. The eighth image is of three rock pebbles from Kirkcaldy beach, the top one of which, nicely shows some cross bedded sandstone, deposited in a shallow sea/deltaic environment approx 300 million years ago (part of the Upper Coal Measures). The pebble to the bottom right is also sandstone, but this time with no obvious bedding, and may have formed as a sand in the river mouth of the huge delta. 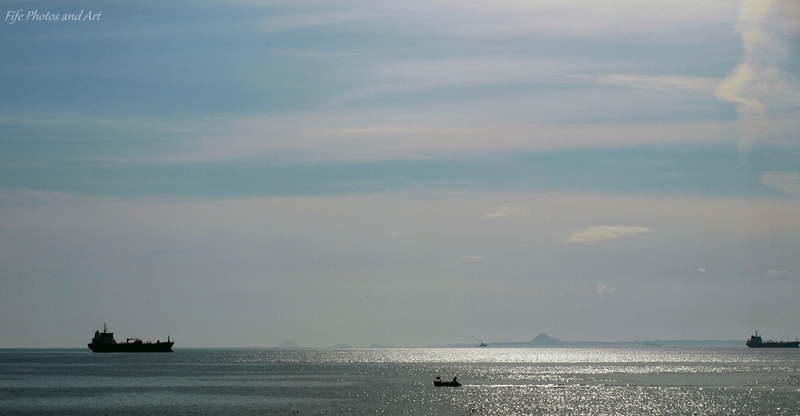 The pebble to the left does not belong to the local area, and has probably been transported southwards to its present resting place during the last Ice Age. It looks like a granite pebble and may well have come from the Glencoe area of the Highlands, which would mean it is approx 420-410 million years old. This entry was posted in Architecture, Fine Art Photography, Geology, History, Weekly Photographic Challenge and tagged beaches, black & white photography, bridges, Carboniferous, Fife, Firth of Forth, Forth Rail Bridge, Geology, Glenrothes, harbours, Hill of Tarvit Mansion, Kirkcaldy, landscape photography, Linlithgow Palace, Scotland, Scottish history, Scottish icons, walls, Weekly Photographic Challenge, wpc. Bookmark the permalink. Fantastic photos, especially I liked photos about bridge, just perfectly caught reflection! hahaha yes so true! lovely! Wow! I love the bridge photos. Very metallic and strong looking! Great post. Yaz. Thanks Yaz 🙂 And I agree with you, the Forth Rail Bridge is an amazing structure! Thanks for these social photographs. I particularly appreciate the photographs of the Forth Bridge. 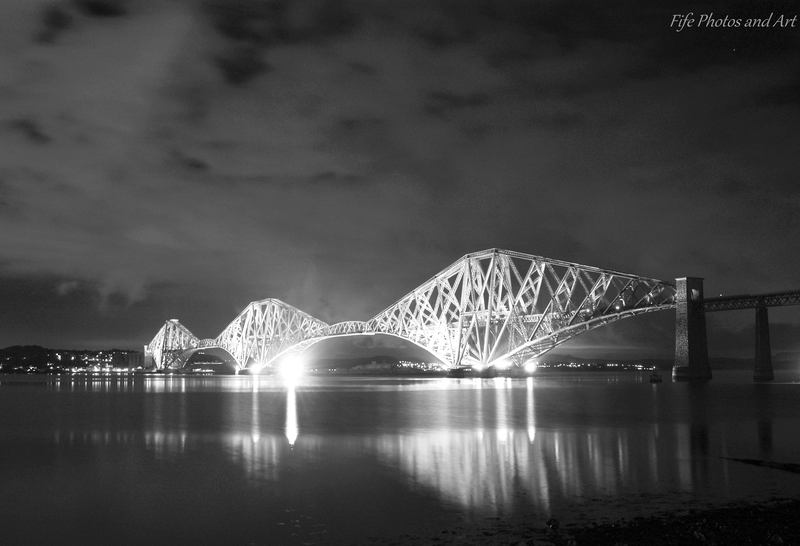 The Forth Bridge is amazing, and social photography fascinates me, but I don’t do enough of it. Thank you Vonita 🙂 The bridge is always popular, but I’m pleased you like the swings :-). The side of the house wasn’t a great photo, it was more to explain about the ‘Window Tax’. Wow!!! It really is a very small world we live in 🙂 Kirkcaldy is quite a nice town, but I don’t blame your grandfather for taking your grandmother back to South Africa!! She went back with her three children when my mom was nine, grandfather to follow, but after a few months she decided Cape Town was better, so re-packed her bags and kids and left again! I think so 😊 My mother ended up in Johannesburg after marrying my dad, but she passed away when I was 21, and I am in Sydney now. Yes, my husband and I left South Africa in 2007, and have only been back a few times since. Though we will never be rid of our South African accents 🙂 my grandmother kept her Scottish accent, it was wonderful to hear! Ah yes, you are from Cornwall! It was so interesting to read up on the windows that were bricked up to avoid being taxed. I can’t believe that people were taxed for the amount of windows they had. Wow! I would have bricked them up! LOL! Those pebbles are just gorgeous! Beautiful colour and texture. I love pebbles and my sons always bring me interesting looking ones. Indeed and believe me, I would have bricked in those tax people as well. hahahah! They can be glad I didn’t live in those times. They would have had quite a difficult time with me. LOL! They sure do as they know I love it. hahahah! I bet they won’t keep quiet for a minute as well. Let’s be thankful they can’t talk. LOL! That is the problem with any type of geological extraction, money and greed always takes over, and the environment is an afterthought. I love the subject, but I don’t love what all the big mining/exploration companies do to the landscape. I totally agree with you. If they rehabilitated the land it would be a totally different case, but they don’t. You’re welcome again and it sure is. Whahahaha! I can only imagine! LOL! Love all these, Andy! Particularly Linlithgow – amazing buttresses – and the Forth Bridge, breathtaking no matter how many times you see it. And the pebbles! How lovely. 🙂 That banded sandstone pebble is very nice indeed. I do admire your ability to be able to recognise them! Every time I hold a pebble in my hand I wonder at its phenomenal age. Love your bridge photos. Love the Forth Bridge, especially the first one. Great reflections. Really neat collection of images for this challenge. I especially liked the bridge images. Some fantastic photos, Andy. Needless to say, I love the old stone buildings – the palace buttresses, the steps and the windows. But your bridge photos with the lovely reflections are excellent, too. 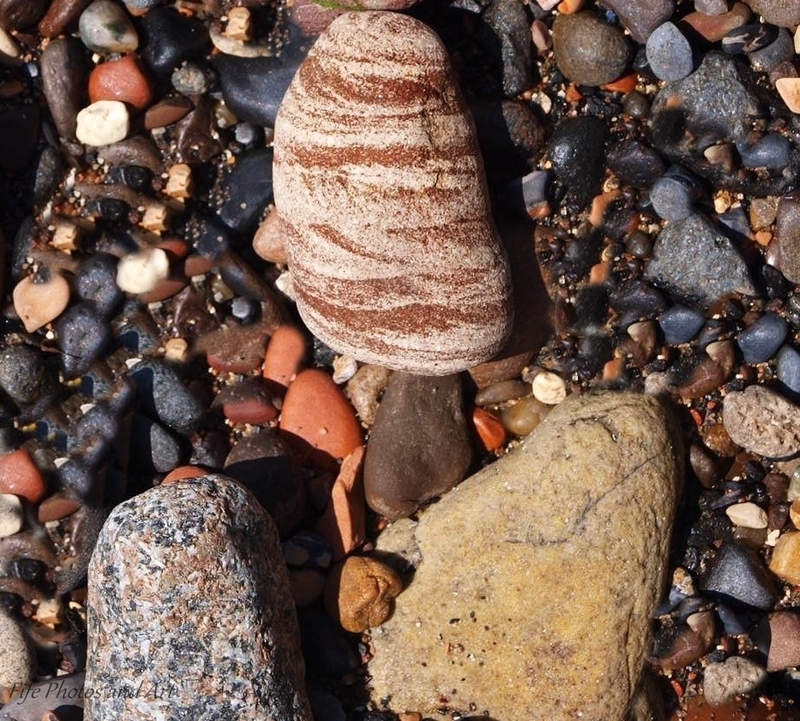 And as for those pebbles… That’s a great granitic one. The pink feldspar reminds me of Shap granite. And is the banded one some kind of gneiss? Lovely photos. My favorite is the colorful one of the bridge. Thank you Judy 🙂 Don’t worry, the window tax was repealed in 1926! But it wouldn’t surprise me if the government now started taxing the air we breathe. In fact, to a point they do, we pay tax on crisps. popcorn and sweets, some of which are almost totally made up of air!!! 😦 LOL! A most imaginative selection of trios. 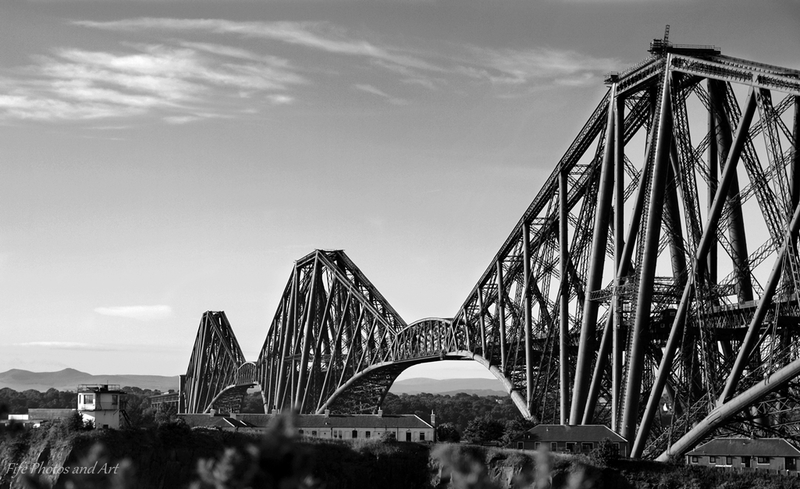 I especially like the first picture of the Forth Rail Bridge, that’s a cracker. Fantastic shots… the ones from the bridge are my favorite! Wonderful selection! I especially liked the trio of “working” swings. Thank you Cathy 🙂 I’m pleased you liked the swings, most people went for the bridge, which was fairly obvious, it being so grand. 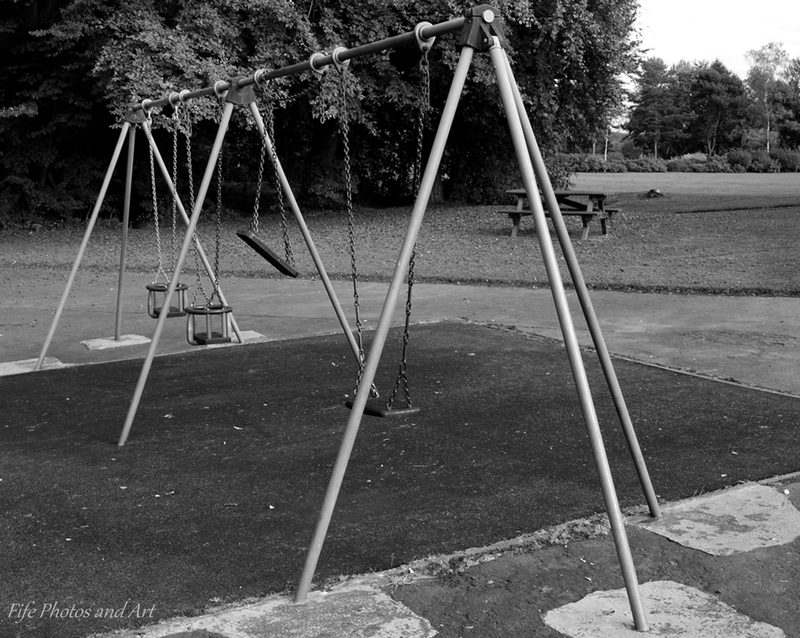 The swings brought back memories and I noticed right away there were 4. I thought it was creative that you said a trio of working swings. I like those buttresses and the sliver of curved light across the lawn. Thank you Susan 🙂 The buttresses are quite impressive, especially because they are approx 600 years old! !